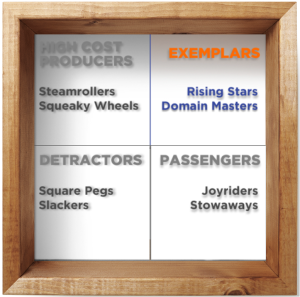 Exemplars are the stars of your team who produce the best and most results while requiring little direction or supervision from you. 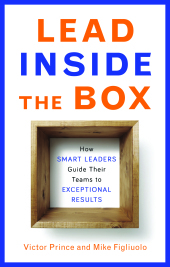 Your overarching leadership goal for this box is retention. You want to keep these employees in your larger organization in roles best suited to unlocking their true potential. A leaders’ time and energy, their “leadership capital,” is scarce and they have to invest it intelligently across all their employees. Over time, you are going to decrease your investment of your leadership capital in this box in line with their self-sufficiency, and refocus what you are doing with that capital. Type 1 – “The Rising Stars” – The Rising Stars are fast rising talents. They have radically, and noticeably, improved how their jobs are done. Their excellent performance has been noticed by others and it is obvious these stars will be moving on to bigger and better things in the future. Leadership Strategy – “Promote Internally” You acknowledge their reliable performance and reduce the amount of supervision you are providing them, thereby freeing up some of your leadership capital. Your goal should be to help them advance toward their career goals while retaining them in your larger organization. Type 2 – “The Domain Masters” – The Domain Masters are amazing producers who never brag, rarely complain, and never seem to need any assistance or guidance. You feel extremely fortunate to have them on your team. You can always count on them to get their jobs done on-time and in a high quality way. Almost everyone loves working with them. The only people who don’t are individuals who feel threatened by the Domain Master’s outstanding performance. Other managers comment on how good these employees are. Some even try to recruit them to their teams. They enjoy their jobs, have been doing them well for years, and seem content to stay in them forever. They have found and mastered their domain. Leadership Strategy – “Nurture in Place” Your goal is to ensure they feel valued and happy in their current role while also finding new challenges to help them continue to grow. Keeping your Exemplars happy and continually challenging them will give them the motivation and incentive they need to keep producing fantastic results while creating no worries for you.